It was a bittersweet day for SANA as it certified its last group of trainees at Aboujaoude Hoapital. 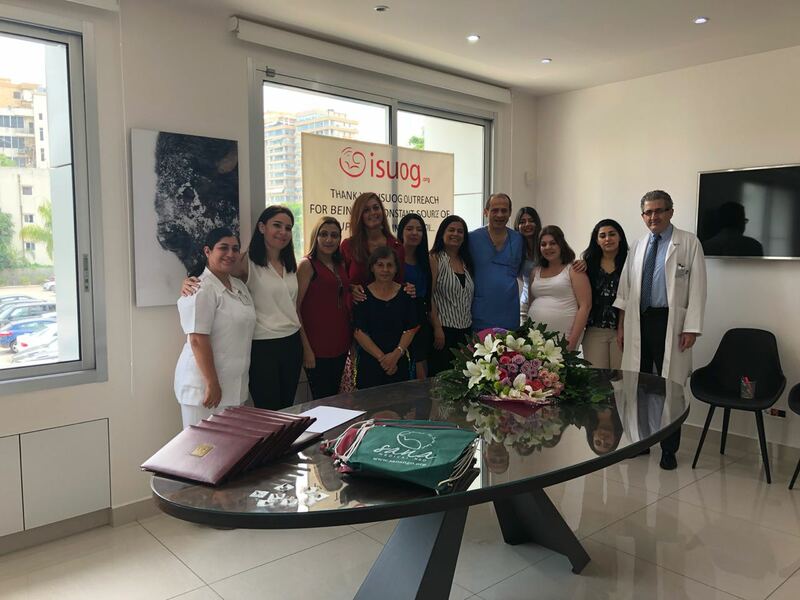 Today, 8 outstanding midwives, who have been working diligently over an intense 5 weeks, received their ISUOG Certification. This brings the total number of SANA’s Outreach trainees to 45, not counting the 10 trainees who recieived the ISUOG BT certification last month. Over the past 5 weeks, the trainees have had intense theoretical as well as hands-on and simulation-based training. They had all passed their practical examination last week and they took their theortical exam today where 4 of the 8 scored 100%. The ceremony was held at Aboujaoude Hospital in the presence of Drs. Imad Aboujaoude, Nabil Helou and SANA’s Reem S. Abu-Rustum. In addition, Ms. Rita Akiki, the Director of the maternity was in attendance. Drs. Aboujaoude and Helou handed the trainees their certificates and Dr. Reem S. Abu-Rustum pinned them with SANA’s pin. SANA returned to Aboujaoude Hospital for a fourth session and next to last session with the midwives today. It was so rewarding to see the drastic progress in their skills! The day started with the midwives sharing their experiences over the past week and with SANA’s Reem S. Abu-Rustum addressing various practical questions they had. 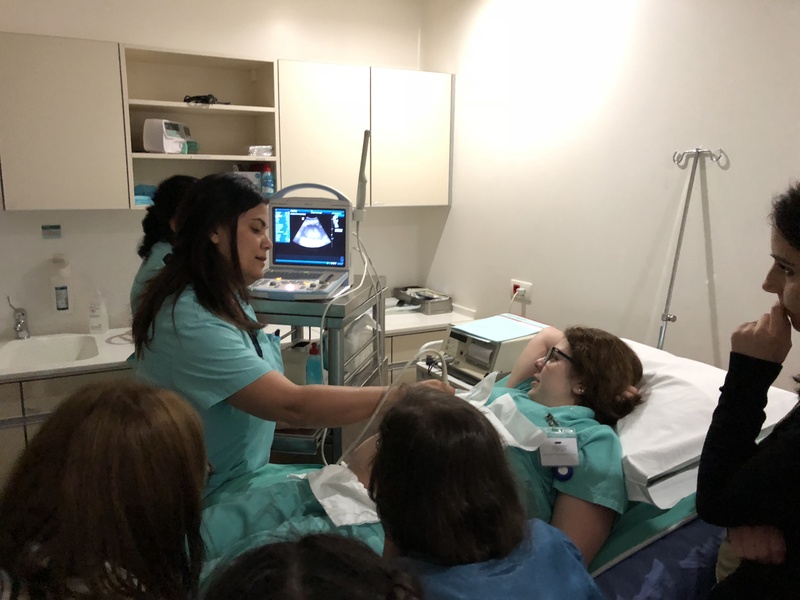 Subsequently a didactic session ensued where the focus was twin gestation and scanning the fetus all through the first trimester. And as has been a weekly ritual, a nice breakfast followed before the team headed to the Labor ward for hands-on scanning. The midwives scanned in a most systematic manner following through with the 6-steps and identifying key anatomic landmarks. In addition, they skillfully obtained biometric measurements. It was indeed an incredible day as SANA returned to Aboujaoude Hospital for a third session with the midwives. Their skill and progress were unbelievable! The day started with the midwives sharing their impressions on using the simulator last week. Then the session focused on fetal anatomy: what should normal anatomy look like? What planes to look at? It was impressive to see the midwives properly identify key anatomic landmarks and interpret fetal lie. As has become customary, a lavish Lebanese breakfast of “Knafeh” ensued before the team moved to Labor and Delivery. The practical session commenced with familiarization with the sonographic machine there and how to adjust image settings for optimization. 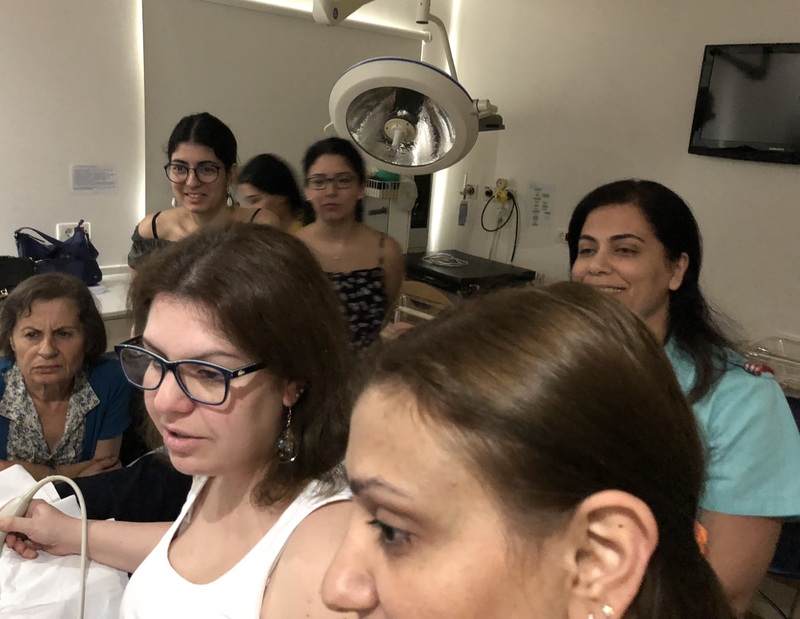 Subsequently the midwives, one by one, scanned a patient first under the guidance of SANA’s Reem S. Abu-Rustum then under each other’s direction. It was truly a sight to see their systematic approach and ability to carry out the 6-Steps with proper biometric planes and measurements! One of the midwives was pregnant herself at 30 weeks. She patiently sat through and let her colleagues scan her and it was so special as each of the midwives got to bong with her baby-on-the-way!